The Death of the Greater Bor Vision. The onset of war in South Sudan was ignited by the Greater Bor influenced. The term greater Bor is a name of the political vision that bring together the people whose their territory integrity start from Chuei-Keer to Chuei-Thon and I believe the ideological vision of the greater Bor must be rested in peace since it lost it main purposes of bringing together the three counties of Bor, Twic and Dukeen. In minds of many under the term described above, the greater Bor name have remains as a symbol of identity to outsiders within the country but it has no values and it becomes too meaningless to be continue. It’s like a political party, and the people who like the party are always free to abandon or remains as the supporters. The same is applied to fake unity of Greater Bor, the name Greater Bor is only a political approach when dealing with other communities, that we use Greater Bor to sounds as to other communities as if we are united community under one umbrella. In other hand, at the sense of achieving something for self interest. So the Greater Bor must indeed be rested in peace. Only that Bor and Twic can still embrace as the people of the greater Dinka origin, as the people who had been together and continue practising the intermarriages for over centuries, or as the people who have cultural similarities if not the most, within the same geopolitical environment, still they are. To begin with, ethnic political violence is a deliberate political strategy used by people who want change to happen to them, tribe by using force or third party force to effect and change the political system that marginalises them or their tribe. Since the emerge of many civil wars in the old Sudan, Bor always had it influences in the conflict and their political elites are always wanted by either government or rebels for their political gains or solution to the conflict. Abel Alier became an instrumental tool by ending the Anya Anya one war in 1972. It’s the culmination of longstanding ethnic leadership competition within Bor & Twic that almost brought down the government of South Sudan under the Leadership of president Salva Kiir. Having Dr. John Garang as a great politician of all times and a greater political philosopher, South Sudan self determination was lastly achieved because people of Twic East & Bor were not parallel at the time of civil war and though there were gravely mistakes done but forgiveness was seen to be the only solution of the Nation building, but the emerged of “East” as the need of tribal identity by Teic to connect their political affiliation to those of the Dinka Bar el Ghazel had simply hijacked the use of Greater Bor. Dr. John times was primarily dominated by Twic East elites and those Elites are today not a paying as much loyalty to president Salva Kiir, so there was(is) a bond of political friction and many of those politicians seeks sidedness to Kiir’s opponent. Kiir tries his best by dissolving his cabinet and appointed only those are loyal so the developments may be progressive but it always ends up as a doom decision. The only person that met loyalty to him and the government is Michael Makuei and not only him, even Dr . John Garang have try his best to bring Michael Makuei closer likewise president Kiir. Michael Makuei is a person of self integrity, he only executed his duties in best interest of the nation by strictly following the principles of the country’s constitution. He respect the role of law and that’s exactly reason why both two leaders linked themselves to Michael Makuei. The same to Elijah Malok Aleng, he is a person with clear objectives, he is straightforwards in making his points publicly without being coined in the darkness. He never failed to point his figure to anyone seem to violate or misrepresenting the direction of country of an institutions. The issue of Michael Makuei is badly interpreted by Teic that he is against them. He is not against Twic but he is against the people who goes astray. Why did John Garang used him in his leadership? The answer to such question will only provides answers to those who perceives him as gossip-politician. Mr. Makuei always to the point, very clear in his views. Dr. Riek is always eyeing for power, and perhaps he could use any chance to emerge by using others a shields to advance his hidden agenda. The miscalculation of Bor politicians that they are against Teic are misperception, though making some Twic elites, especially politicians. Some of them chooses to self-allied to Riek, it’s not the people who are always counted for but their representatives in the federal and the local levels of government. I am not going to quotes of as says especially what I had watched recently when madam Garang only condemned the atrocities committed against Nuer in juba but failed terribly to see the massacre in Bor plus other Dinka who lost their lives innocently in areas occupied by Nuer. In some point as well Michael Makuei did some mistakes by generalising Twic according to outcries from Twic civi population around the globe. Twic were condemning Makuei misrepresenting Twic in bad image by tarnishing them I. Negative views. Nyandeng claimed she was terribly painted black by mr. Lueth. Nothing was out of context, but precisely the quote below was primary used by every politicians not by Makuei. “Nuer are targeted” should madam nyandeng also condemned Dr. Riek for crimes his forces committed, she would have been neutral in this crisis but as long she taking one side by not making any comment about Bor or Dinka were targeted, therefore that would have been a great achievement and in fact the last chance of being a great mother of the Nation. Honestly, only what I had watched in TV during the peace negotiation between the government delegates and the Rebels was disturbing. It was clear at the rebels side and who from Dinka condemned who…………and why? As an ideology, the Twic political elites assumed that Bor politicians are working day and night trying to marginalised them, something I believe it has no basic justification and in the same views to Bor that Twic are trying hard to do dirty politics against them , especially thing which has no prove. It’s political tension between the two communities. One side is trying it best to tackles and wrestle in need to come to power by any cost…..using Nuer as a point of coming back to power if coup succeeded or rebellion toppled the ruling party or otherwise if the the Ethiopia agreement bears some fruits which in some individuals will absolutely bring some into power. Twic and Bor are divided politically and it will only be a miracle to unite them. Diaspora is the worse, churches separation and so on………Please don’t always get mad when encountered by truths. Only truths set you free……. This crisis was totally supported and directed by some elites whether For their regional gain or for self interest, I will rest it there………..
It’s only make sense to tells the truths. “This is a message to Buor, especially the so-called politicians. When Riek Machar rebelled in 91, and then Nyuon followed in 92; what they did doesn’t need any further explanation because we are all aware of it. If the Jieng of Bar El Ghazal had also rebelled, do you think Dr.John Garang would have reached Naivasha? Do you think he would have signed peace? When Nuer rebelled, the Jieng of Bar El Ghazal stayed in war with us because they are Monyjang. We remain with Garang because he’s our son and he was fighting for South Sudanese aspirations. Despite anything, Kiir is everyone’s leader and we must stand with him. Nevertheless, inequitable distribution of resources in a Juba is not equivalence to the destruction of South Sudan. However, during 21 years of struggle, we survived without resources. This message is only for those who are conscious. If there’s someone among you who seriously love Garang then you should have a lot of reasons to hate someone like Riek Machar. We are a small community, but the Jieng of Bar El Ghazal has always supported us. For instance, when we went to the bush, Jieng of Bar El Ghazal was fully behind us. I, who’s speaking here, there’s no any other place that I haven’t shot a gun in South Sudan during the liberation, and I have never tasted South Sudanese pound because we signed peace and I left; however, I’m happy because we have our country. If there’s someone out there who will bring shame to you Monyjang then it’s Riek Machar, because he has destroyed the country. Take the history of Hutu-Tutsi, Riek Machar is someone who’s willing to extinct ethnicities in South Sudan. Listen carefully, a leader cannot be an opportunist or even emerge as a leader through shameful act. To all the elders of this community, I advice you not neglect our children and believe they belong somewhere else. We cannot allow our kids to insult people and believe they are speaking the truth! Is there’s anyone who can claim that Garang is the son of Awulian alone if he’s not our son? I doubt Awulian will say that Garang took the lead because of them; Garang led the people of South Sudan because he’s our son and we all supported him. If I want want leadership I will ask Paleek Community to take me to Bor Community; Bor Community will then take me to Jieng; Jieng will then take me to Jieng of Bar El Ghazal; Monyang will then take me to Junubin. If I want leadership I will first go to Bar El Ghazal because none of you cannot emerge as a leader without their support. They are our people. A leader must be endorsed by his/her people with jubilation and ululations. Hence,one cannot hide his/herself where he/she cannot be supported because no one can come up without his people’s support. Monyang, you’re cornered everywhere and your disunity will bring shame to all of us. To reiterate, Nuer Community is not the problem; Riek Machar is the person who’s leading innocent people in a wrong direction”. This is an ‘excerpt ‘transcribed’ from from Mabior Maleer’s speech during the funeral. Note: Any community stated above was mentioned in the context of Garang’s birth place, and NOT because the message was intended for that community. The Grand Confusion On Federalism: How Making Last Things First Leads to a Loss of Direction. Is South Sudan already a federal state? Is the current call for federalism a pretext for confederation? The issue of federalism for South Sudan, especially on social and print media, has recently sparked one of the hottest debates among South Sudanese, home and diaspora alike. Since its renewed call by the rebels (call them armed opposition), so much about it has been said by different writers and in fact repeatedly that this article would not have been needful had enough really been enough. But following an argument with a friend on federalism, who eventually convincingly gave up his understanding, he asked me to put, in writing, my view about it and how it has been misunderstood in South Sudan. Along this line, therefore, coupled with disturbing, misconceived arguments about federalism on social and news sites that I have always seen but resist my urge to join in, I finally thought that this writing, intended to be informal but true to the title, is a good idea worth blacking-on-white. First of all, federalism is defined as a system of government in which sovereignty of an independent territory is constitutionally divided between a central governing authority and constituent political units (such as states or provinces of the main territory). In other words, it is a system of governance based on democratic rules and institutions in which the power to govern is shared between the national and provincial or state governments, resulting into a federation. Whereas federalism is synonymous with federation, confederation is morphologically a look-alike of federation but the two are, intrinsically, greatly contrastive. Confederation (also confederacy), on the other hand, is a union of political units (states or regions) for a common action in relation to other units and is usually created and governed based on a treaty and, following its formation, a common constitution. The marked functional difference between confederation and federation is that the former is quite a loose alliance between the constituent autonomous or semiautonomous units, has a weaker central authority and, depending on the treaty, each member unit may choose to break away from the confederation. The latter, whereas, has a stronger central authority and the constituent states/provinces cannot normally secede from main entity. Due to the large difference between the laws of the member units and those of the central authority in a confederation, citizens in a confederation do not enjoy equal rights as those in a federation do. USA is an example of a federation (with fifty states) while former Serbia and Montenegro was, till 2006, a confederation. 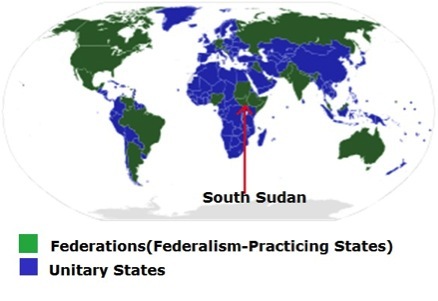 Straight-away and to casually begin with federalism is not bad for South Sudan especially if its basic meaning among South Sudanese is to be taken as same as it is internationally known. 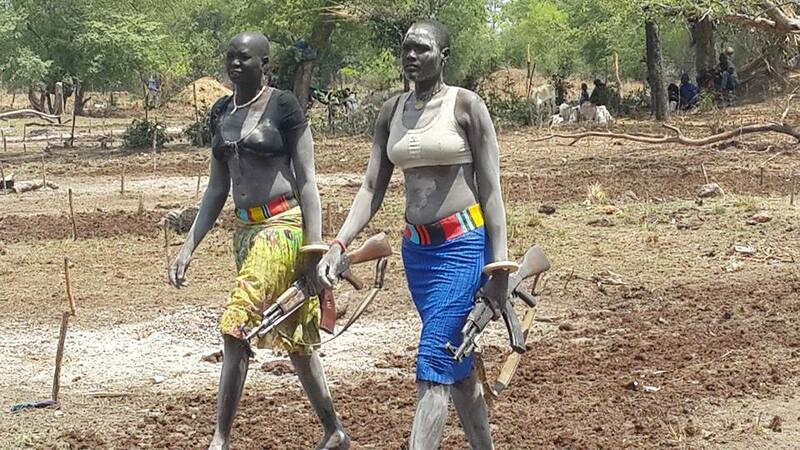 But bad is the way South Sudanese, judging from the recent utterances and debates, interpret it, the alleged or apparent motives behind its call, the stereotypes that have been attached to it and the circumstances surrounding its renewed call. Renewed call because, neither was it the first time leaders of SPLM (in its several variants; SPLM, SPLM-DC and SPLM-IO especially the last one that re-raised it) called for it nor was it the first time federalism was ever called for. As it has recently become apparent, almost all those who talked in favour of federalism did say that “now is the time for federalism and or we (or the people of …) are for federalism” without elaborating on what system is currently in existence and its comparative down-sides or how and when “federalism now being called for” will really work any better for the humble people than whatever system was there before. As long as there is no clarity in these, confusion, whether or not intentional, is bound to submerge the call. But believe it or not, South Sudan is structurally and facially federal. The country already clearly has federalism in structure and administrative set-up but faintly constitution-wise. The country has states not just by names but with the main branches of government represented in them. They make their own state laws in their state legislative assemblies, characteristic of a federal system. In world records, the new country is classified, by governance type, as a presidential republic with federal system of governance. On several records, however, there have been gross violations of the system if it were to be taken as in some countries. Demarcation of powers and share of proceeds from the national cake between the state and central governments, for example, are unclear and sometimes completely lacking. This is due to how the transitional constitution, the legal guarantor of the existence of state and central governments and of federalism, was designed in 2011. The lack of the word federalism itself in it is un-debatable but should not be the reason for the call if the practice of the system was clearly stipulated in the constitution and was really working. As such those backing “federalism now being called for” should not have expressed this call as though federalism were something completely new and non-existent in South Sudan. Since we already have federalism but in a poor or unsatisfactory functional form, current calls should clearly be for a revitalization of the existing defunct federal system, for which we already have structures, some laws and experience with (negative or good). This can be done through amending the constitution to solve such already committed blunders as the undefined “event” or nature of the statement “in the event of a crisis that threatens national security and integrity” in the presidential power to removal an elected governor in article 101(r) of the Transitional Constitution. The governance and political problems we now have are not because we do not have federalism but because the law that governs its practice was not appropriately put in place. On top people (the politicians, the leaders, the actors) are instead the problem. They are the same people who served, are now serving and or are now calling for it even if they did not practice it when they had a chance to and worse still are now not telling citizens correctly how to correct the loopholes so far seen in the less practical but structural federalism we currently have and which only needs to be reformed. This precision should be drawn and made understandable first of all. However, the pro-federalism and anti-federalism alike are instead just confusing the masses about what really is federalism. What amuses me is how all the top politicians; the president, vice president, governors, rebel leaders are making it confusing and ridiculous. I was surprised when I read most of these people say federalism is what people of Southern Sudan needed before South Sudan was attained, even in 1947 Juba Conference. Some even went as far as forming committees to be sent to Upper Nile (interesting why Upper Nile alone of all the three regions) to engage with or campaign to people on federalism without recalling that most of the people there are in horrible conditions either on the run, in UN camps, hiding in the forest or holding guns in defence of their threatened lives. Why make a mountain out of a mole hill over federalism to that extent? If the suffering people in Upper Nile could be honoured with a visit, such should undoubtedly be for relief food, shelter items and how to bring back peace and normalcy to their area. But on the contrary and as though wisdom has been killed by air conditioned rooms and cars in Juba, Addis Ababa, name it, they are going for something that concerns the future not the current conditions. ” Chief Lapponya stated that the principle of unity could only be decided later when the Southerners were grown up, by which time they would be in a position to decide whether to join the North or go to the Belgian Congo or Uganda” Unquote. These quotes show more than anything that what was asked for in the 1947 Juba conference was actually a confederation within which the then Southern Sudan would choose in the future to break away if things did not work out as the Southerners had actually suspected. If current calls do really intend federalism, then there is no need for restructuring of states, no need for regional based federalism but rather state based federalism (ten states as of now). But since some people think that and are actively seeking for region based federalism, this can be more deeply interpreted as a call for confederation codenamed federalism or as, some people have already charged, ways of garnering political support from the masses, ensuring a comeback in government in another form to basically continue with the same cults as before. South Sudanese ordinary citizens should look more beyond such stereotypes as some regions are resource poorer or richer than others merely as ways of buying through a hidden agenda in the name of federalism. For facts, no region in South Sudan is poorer than the other. Each is unique and gifted in its own way. For example, in my region/state as well as the entire country, I am so well aware of the untapped natural mineral endowments we have that no stereotypes will set me blind on what matters to the whole of South Sudan. It is needless to mention all such known plus the unknown resources. If the current direct crooked, unscrupulous and deserving beneficiaries of the ongoing oil production do not know the localities or communities on whose land oil is now being pumped out from, how would they know other areas with discovered but untapped oil and other resources? Only time will prove the drummers of such a campaign that is as worthless for all of us as South Sudanese as well as to the acceptance of the good word (federalism) that is now being portrayed as a bad one. Only the ignorant would be worried by their region being mislabelled as poor or who would celebrate their region labelling as richer than the rest and think that their regions/states/localities are solely theirs without all other South Sudanese. Personally, federalism, as really it is but not that “federalism being called for”, is ideal for South Sudan, but not now, not even in the next two years or so and certainly not in the manner it is being pursued. It may be adopted just as applied in the USA, Germany or India and then modified to our setting. However, with the prevailing misconceptions about it and the current rate of corruption and weak institutions, that have already handicapped the blurry form of it that we have, it will not bring us free honey and milk neither good governance as we see in those countries but we could still remain as we now are or go the Nigerian way or even worse. Given the current circumstances, the senseless bloodbath and incessant untold human suffering, is it really the wise thing that we should so prioritize in such a way as some politicians have already formed committees to go to other regions for its campaign? This is clearly explains the doubts to the intention dubbed federalism. It would be better to be frank about that hidden, ugly agenda and get credited for honesty than pretend when the intentions are readable. “I think we should be honest enough and admit that what we are really talking about in South Sudan is “confederation” and not “federation”…the level of trust needed for a federal system is lacking…not to say it is impossible…but confederation can be a transition to eventual federation…because it can be argued that we already have a federal system…a lot of successful federal systems started out as confederations…before they became federal systems” 7th June, 2014 Mabior Garang de Mabior Facebook Page. That is a recommendable honesty. If there is anything I know Mabioor is best at, it is telling people where he stands. Just as in this case and in his support for Dr Riek Machar, the man his own father once cursed and labelled as a traitor and the same man who once butchered his uncles, cousins and grandparents and actually later accepted responsibility. It was mind-boggling how Mabioor went for his backing. But it is more of a noble virtue when a man stands clear and firm in his position, however wrong he may be considered, than when he always practices democracy even in situation where his democratic virtue lacks basis. Those are his opinions though and he has the right to go for what he wishes. But his position on the system of governance that South Sudan should adopt is certainly wrong and irrelevant. Confederation, knowing its self-autonomous nature and how potentially it may create risks of disintegration, is NOT good for South Sudan whatsoever as there are no justifications for its call (or whenever there are, they are never fitting for solutions to our problems not even as mock solutions or last resorts). What South Sudan needs is not autonomy for its regions or states. All that is needed is equitable distribution and management of revenues from our resources, fair share of power for all our communities and above all a united, dignified South Sudan. These are by far possible without any need of confederation. In the nutshell, federalism is good, we already have it but with weak state governments and we only need to rejuvenate it in our own way that suit us as South Sudanese rather than take it as Americans, Germans, etc have it. This has to be done through an all-inclusive constitutional review and amendment and if there are serious objections to it from the citizens, then it has to be voted for in a referendum as President Kiir Mayardid once said. The time now is not rife and right for discussing it as all energies should be dedicated to peacefully stopping the current ravaging conflict and suffering of our people. First things should be first. Where will it be implemented even if unanimously accepted now as the proponents want it if this conflict is not resolved first? We should be realistic enough to start the walk from the mountain foot to the top rather than vice versa. In the peace talks the involved parties should focus their lenses on the interim national unity government and national reconciliation and subsequently federalism as mentioned above and in the timeline of 2 -3 years down the successful interim government. Prior to that time, public awareness on federalism will have to be disseminated for people to avoid such misunderstandings with federalism as has been seen so far and similar other wrong understandings such as Paloj is only for Ngook or Abyei is only for the nine Ngook chiefdoms, Kapoeta is only for Taposa, Rumbek is only for Agaar, Yambio is only for Zande, Turalei is only for Twij, Pibor is only for Murle or Kejokeji is only for Kuku, et cetra. Remember we have a number of our territories to bring back into our territorial integrity and control while at the same time we have an acid test to pass before the world; ‘that we are capable of governing ourselves without disintegrating into tribes or whatever units as we now seem to transcend in just as our ill-wishers had forewarned’. South Sudan: Democracy or Dictatorship, the Fall of the Republic. I have to confess! As a matter of scholarly, it’s extremely difficult to talk about the republic of South Sudan or its issues in a purely objective mode of communication; precisely because: this polity follows no line of the established political theorizing (as they have been practiced from the days of the Greeks, even the Romans, the Chinese or the American and French Revolutions). Whether it disagrees with the ancient wisdom is another; but it too must be ‘scholarly’. And neither does it follow anything consistent with its indigenous norms; I mean its political, social or economic make-up is at odds with anything conventional: political or otherwise. 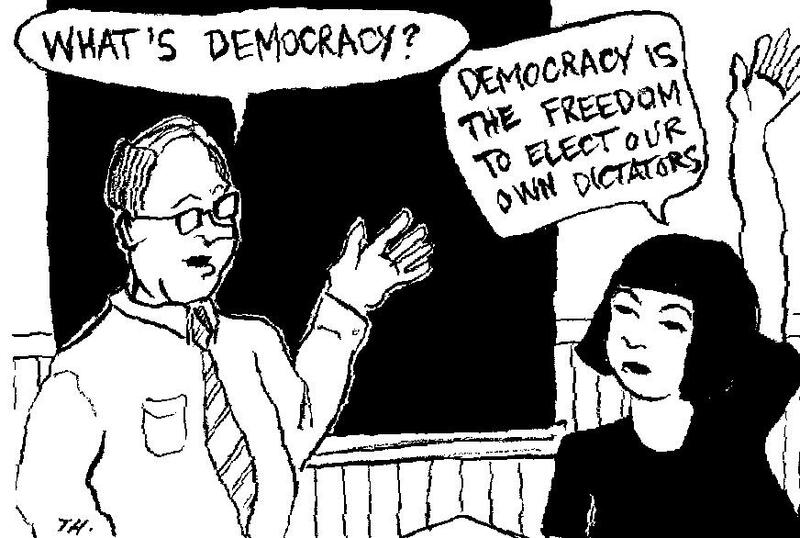 This article attempts to explain issues pertaining to the relationship that inherently exists: between the state and its citizenry; it’s an illustration of the situation from an objective observation or standpoint view; and presents somewhat general theory of the political theorizing that humanity has found ‘almost’ compatible with its free nature, albeit modifications: Democracy. I will begin with the basic document of the land: Its Constitution. The aim is to demonstrate somewhat should be its key objective: Making Peace a way of Life in South Sudan; turning tribes into a single nation. ‘South Sudan’ must clearly stipulate: What it really means to be a citizen of that land. Whether the land owns the citizens or they own the land: that verdict is important to hear; but is sadly lacking. I will briefly touch on the successive constitutional making’s failures. Recall the Southern Sudan’s and the current, Transitional one’s (-and maybe, just may be another Transitional one and so on) and demonstrate that constitutional failures I thus outlined above. My view is that such failures will persist: irrespective of how many constitutions written or to be written; for they stem from: the denial of the ‘internal’ differences; and which consequentially thwarts any compromise it should entail; but one may say they are personal, subjective views. I agree. And I am completely aware of the geo-political culture of that ‘land’: including telling the “youth” to wait ‘until’ they’re ‘old’ enough to talk about their future; not when they’ve learned what it takes to be a society morally or otherwise. In fact, the word “youth” in this part of the world, is a vague one. It has no clear distinction of say, at what age is the “youth” or even “old man” is old enough to be ‘wise’; or in the case of youth in particular, precisely at what “age” is his or her “consent” considered his or her own view on anything, and when is an individual youth, is considered wise enough to talk about what? And when is he wise enough than the old man; and whether such a ‘competition’ is unwinnable for youth at all. But is this attenable? I leave that for you to decide its truth. But, my friends: if I made myself clear. This is a struggle in itself that this country has to first and foremost “solve”. I expressed them here, however, not as ‘privilege’ or am I ‘entitled’ to do so; but to urge or demonstrate my concerns. The article is informed by this author three-time visits to South Sudan. And its situation continues to deteriorate-indeed, the republic that all of us would like to see, has fallen since the day of its proclamation: for it was not strong enough in its autonomous or teenage age to stand up. Since the formation of a sovereign South Sudan, the “would be” citizens of this brand new nation have tried to tear down the heightened bars of secrecy to the information on the so-called permanent constitution of South Sudan. Already, the process to draft the constitution had in many respects, been the subject of intense controversy. And so far, only a few have queried such secrecy and voiced their concerns in regards to the making of the basic document of the land and what should be expected, notably: Luka Biöng Deng in his article dated march 12th, 2013 and published by Sudan Tribune pointed out a “violation” to the then interim Constitution of the then Southern Sudan. What he seems to argue here, is that: by the time of the ‘interim constitution’ it was meant that if Southern Sudan were to succeed(and indeed it happened), that constitution were to be deemed “permanent) and no further constitution(s) were to be written; thus its “violation” in according to him. However, it is not a mere “scanning out” of the violation and the expectations of the same for the document that is understood only by foreign-educated individuals; and who used it to advance their interests in expense of a blind owner, that might warrant the most crucial document to be made in regards to: individual liberty, the continuity of government, solve problems of internal matters, and other necessary provisions: [a] “legitimacy” or “permanence” that all of us would like to see in south Sudan. But, rather, on what it should provide as “solution” to the nation’s structural, yet urgent concerns, thus by confronting the pressing issues on the nation-building project heads-on: how to turns tribes into citizens and make peace dependent on, and a way of life to the south Sudanese people. Sadly, though, this proposal will not give rooms to issues of internal peace, to be discussed in luxurious hotels in foreign lands: something that I personally see, given the usual catastrophic nightmares that preceded them, as nothing less than a “vulture’s tourism”. And gatherings in foreign states, often in luxurious hotels in the names of peace is nothing but “Scavenging” for deals after heinous distraction of human lives which have no value for indemnities. I said above ‘this proposal will not give rooms’ for our matters of “peace” to be discussed, or “solutions” imported from foreign countries. But dictated by the agreement we make as the south Sudanese people or citizens: hence our constitution solving our problems. My contention here, however, is that such document which automatically becomes the supreme law of the land by the time of passage will continue to solve no problem in South Sudan: given the diversity of south Sudan whether ethnical, authoritarian or democratic– a system might be. We’ve to make sure, given the depth and structure that some of these issues might have, “constitution” as “a permanent document” on our internal agreement should solve most of them, once and for all. In so doing, and with assiduous interpretations of the constitution, would “dictate” to south Sudanese people that Peace is a way of Life in South Sudan. And not be discussed or brought from foreign lands (how many Addis Ababa peace agreements that have been signed in the names of south Sudan). As Professor Beny and Dr. Adam (2014) observe: “the root causes of [the current] crisis are deeper and structural”. The duos go on to list among other pressing issues: poor governance, tribalism, nepotism and corruption–issues according to them, should: “be addressed within a comprehensive and inclusive framework”. While I agree with these sentiments, I would also like to draw attention to other relevant issues often overlooked not only by academic commentators who would, nevertheless, wish to see South Sudan succeeds as a viable state, but also overlooked by those who under obscured processes are involved in the making of the basic document(s) of South Sudan—its constitution. Wether deemed permanent or temporary will always solve nothing of the issues that it should address. Equally important is on how consistent, professor Laura Nyantung Beny in particular, has continued to raise these issues for quite sometimes, yet nothing has been done about them, despite how helpful her insights are to the ruling elites. The fact that SPLM’s popularity has plummeted and has politically lost its direction is self-evident, as a result of pervasive corruption; nepotism and tribalism: To an extent that these practices are becoming accepted way of doing business in south Sudan. As always is a case with politics, the continuing effort to conflate accusations, both false and true, is tendentious; but as a mass movement, the SPLM was seen or considered by the ‘same’ South Sudanese people somewhat, not forming part of the elite of the society, but to bring about pervasive changes in existing social, economic, or political institutions; and throughout its earlier days, was frequently characterized by Dr. Garang’s charismatic leadership—thus, its seamless relationship with the then “southern Sudan” masses at the time. So, the society really knows, through feelings and treatment they get from the current government and a country they helped founded. Hence the loss of direction of the SPLM party, that south Sudanese are talking about. The constitutional Failures: the neglect of the root causes. The Transitional Constitution that currently governed the South Sudan as sovereign entity makes the president of South Sudan one of the most powerful in Africa. While necessary to be presumably above prevailing government institutions, according to most modern government theorizing. The president cannot, in south Sudan, one could say, a clear slam door to democracy, be impeached by parliament; and has the power to prorogue the parliament of any of the 10 states, sacks or deposes the elected governors and call for elections within three months (often when he pleases: until today, there hasn’t been any by-elections in regards to this). From as far as the establishment of the autonomous Southern Sudan, well into the current days dubbed “The Transitional Periods” of south Sudan, the so-called Constitutional Review Commission (CRC) members had and have not, in my opinion, looked critically on the inherent, yet potentially divisive topics; which, either perceived or felt might prevent South Sudan from becoming a viable state. And had these perpetual issues been given their due attentions, the commission would, perhaps suggest functional mechanisms: institutional or otherwise or ways on how to forge beyond those grounds—in fact having some of these issues enshrine (d) into the supreme law of the land. In the above preceding, I highlighted what constitution- as our agreement, not imported foreign product, should solve. But in lieu of that, a “constitution” making in South Sudan is a contentious one, often marred by threats or intimidations, secrecy, haste and poor communications. It’s not seen as an opportunity to collectively devise objective mechanisms on which to conduct ourselves, yet within the confines of our authority and responsibility—what do we think that, the role of our “state” should be? Instead and often is the case, others demand more rights, not less, from others—not citizens demanding rights from the state—though with an exorbitant responsibility, including extracting “taxes” even from an unemployed citizenry(a welfare “to” state one could say) and other extortions enforced on them. What I mean by that is this: nowhere in the world does an unemployed citizen pay taxes to state authorities. If so, then I referred to this as the ‘welfare to state’. Not state welfare for its citizens: which the modern state theorists emphasized. Partly responsible for burying things under the rug in regards to constitution makings in south Sudan is, schism to deter the “knowns” and ostensible denial of the “reality” that any nation befalls its citizens. Always essential (a codified constitution), more importantly to the nations which emerge troubled by a colossal of issues this programme is often and again, poorly communicated and hastened in without equipping the stakeholders with necessary knowledge to enable them participate in its making. And while the government communication is poor and wrong, is one thing. The other is that: It potentially risks, alongside the already wide spread resentment, being seen as conveying a message as if the citizens now belonged to government and not the country. That is why, I think, the Commission(s) on Constitution should not concern itself with the issue of how much power and who to immensely concentrate it on his or her hands, but with issues it should recommend to deemed constitutional regardless of whoever rules South Sudan; it has the capacity of a critical eye purposely tasked with (I presume): first and foremost embarking on researching the very “nature”–on which the present-day South Sudan communities are based or built on; their sense of Order or democracy; their sense of diversity and equality; where their day-to-day allegiances and loyalties lie; whether the communities (internal nations) that make up South Sudan prefer the “modern” system of governance or not; and whether they’re aware of the role of state or government; and whether each community is happy and aware of the existence of the other communities and recognised their right to exist and yet occupy the same physical space with them—south Sudan. A notorious fact of which South Sudanese shouldn’t shy away from is that: South Sudan is a mere assemblage of communities with ethnically -entrenched views about each other, and who may be in one way or other, nations in their own rights. And are thus, given the statehood of South Sudan, these nations, irrespective of their feelings, are nations themselves within a nation and that fact must be recognised. Take for example in South Sudan, by picking on random, one of the elected MPs, and compare him or her with a tribal chief. And also ask a South Sudanese citizen again at random, to tell you who he or she thinks can get away with the claim of ‘representing’ people and can command influence? – I am pretty sure as a Sudanese tribal chief does both. So, the question is what is the use of the modern governance in South Sudan anyway? I mean where or what is the basis of government in South Sudan? Although other democratic states for example: the United Kingdom have managed to steer a successful nation-building efforts for years without a codified constitution, constitutions have come to embody or symbolise the highest laws of a sovereign nation. In addition to moral appeal, they act as the permanent basis of which, subsequent, often numerous documents (statutory or acts) continue to be based upon. While I wish to see South Sudan having its codified constitution and assiduous implementations, one thing that I personally would like to see in regards to this document whether it is to be permanent or not, is to make sure the issue of “internal nations” is addressed. Addressing this issue would entail, not only solutions to the “deeper and structural issues” that professor Beny and Adam (2014) raised as critical; and if without an enabling environment, would continue to woe South Sudan into abyss—political or tribal. But, would imbue the often hypothetically over-used words: “lasting solution or long lasting peace” with a sense of hope and necessary meaning in South Sudan. Currently in south Sudan, as Beny and Adam note, the reverse of this is true: citizens are turned through poor governance, nepotism, corruption and tribalism into tribes. I am not at this point, questioning albeit its absence, what it means to be a South Sudan citizen? Rather, on what platform? South Sudan stands. To many Africans, alongside South Sudan, the conception of a state or government or political authority, say, is fluid in nature; it is not either the collective way we ought to live or the creation of an enabling environment for one to decide on what [s]he wants to do within the prevailing opportunity. For that matter and for African states to succeed the conception of a state oughts to have a philosophical base-a base for what it means for the continuity or discontinuity for its citizenry. Something, up to more than a half of a century in independence is still painfully lacking. One thing that most Africans agree on is that “the power” of a state or government kills. Yes! We all know that. But for what reason(s) should a human life that we ‘know ‘have to perish in the hands of an institution whose “good” is to avoid such unnecessary demise, is indeed unanswered. Though this piece is not on African states and their sense of citizenship, I am happy to have registered my indignant with the issue as above. But, with the citizenship of such “assemblage” nation based primarily on kinships to either of the clustered communities, South Sudan as a “state” is morally lacking a convincing platform on which it’s or is to be based on—whether Salva Kiir or anyone else is a president of South Sudan. In the same way, others might optimistically think that the sole purpose of South Sudan is, if at all there’s a such, to transform these disparate nations with their highly entrenched animosities or differences into a single nation is fine, but the methods are either not on the grounds or there isn’t a functional capacity on the side of the South Sudan’s elite’s echelon to envisage them. Imagine how hard it is, presently in South Sudan: to ideally transform an Equatorian (proud to be Equatorian and yet a South Sudan citizen) into a Nuer and vice-versa. I think, therefore, it would be wise to concede to the tribal nature of the citizenry of the South Sudanese people, and simultaneously seeking other viable ways for how to peacefully co-exist; as Akol rightfully puts: “Refusing to recognize the reality of our diversity in the last 50 years of independence has not lessened tribalism; if anything tribalism has continued to blossom under that denial”. We should accept tribes alongside their “progressive values of our cultures” as moral basis of a sovereignty to warrant the case of unity and diversity in South Sudan. And by so doing, we’d turn tribes into citizens (emphasis below). So, a more manageable, “administrative” division of the current South Sudan should be sought after, primarily into three (3) autonomous, internal nations, which should serve as the legitimate, yet moral platform(s) on which a sovereign South Sudan could be based on; suggestively into: The kingdom of Shilluk territory, The Panjäng (the current Dinka territory/nation), Equatoria, and The Nuer or Naathland, etc., and recognised them in virtue of a codified constitution– their rights to exist as nations within South Sudan. It seems though, those agitating for federalism may be aiming for something along this similar line of reasoning. But, I have no intention to argue for or against “federalism” here. My view is that: As a “decentralized” system, it would, in the case of South Sudan, it’s no less the same with what GOSS is today-minus “ousting” of elected governors and replace them with somewhat cronies. But, what worth being talk about is whether the system works: “GOSS” or “federal”. In virtue of “devotional” I stated about, however, the call for a similar constitution can be traced back as far as early 2000s in a conference dubbed “the House of Nationalities” in Nairobi, Kenya. Although Switzerland was at the time of that conference, a guide, chiefly due to its ability in creating an enabling environment for its disparate communities in forming a viable nation and for peaceful co-existence. Similarly, for the case of South Sudan, the idea was, inter alia on how: “How can the more than sixty ethnic communities living in the South Sudan unite while preserving their diversity and keeping their dignity?” Although neither rejected nor taken, the idea has recently been re-invoked in the early days of this conflict, by Jacob J. Akol (2014)–himself a participant of the conference at the time. In his article “What’s next for a Lasting Peace and Unity in South Sudan?” [And why] “We should use this crisis as an opportunity to revisit what we recognised before the Comprehensive Peace Agreement and Independence”. In it, Mr. Akol suggests that: “we should [the south Sudanese people] go deeper than that to critically look at who we really are as a people and what it is that we should recognize, give form and respect as the basis for our unity”. By “Than that”, Akol means the presumably defunct regions: Bahr el Ghazal, Equatoria, and the Upper Nile. While concurring with Akol on notional use of these “regions” at political bargaining; their current use should in the first place be deemed unjustified right away from the autonomous days of the southern Sudan and through into the current days of a sovereign South Sudan since: the South Sudanese Constitution recognised only the current ten (10) states, and not the former. But having said that, and even at the time of writing this piece and in the advent of the conflict, regional overtones could be heard, particularly from some officials in states or in the Government of South Sudan, and of Equatorian political footings. Government chief whip and an elected MP from Eastern Equatoria, Tulio Odongi Ayahu, for example, while urging restraint and dialogues and in talks with the country’s vice-president, Igga, warned that: “the Equatoria region would not be a participant in the conflict”. Here, I would say that, not only does “Equatoria” not exist, but would recommend that it existence be guaranteed by an agreed upon constitution of South Sudan. But, no reason(s), if ethnicity is any guides, it would not allow Upper Nile stays as “Upper Nile” given the horror that the ethnic members of the Dinka tribes face when this very region plunges into violence: political or otherwise: in 1991 and December 2013. South Sudan: Which system(s) of governance do you use? While the salient quality of the government is its sincerity and directness towards its citizens; a remedy, in my view, lies with an outright “devolution” from the so-called “decentralized system” of governance currently in some form of use in South Sudan. Though similar in contents with the decentralised systems, devolution in particular has, since its introduction in the United Kingdom by the Blair’s government, proven records of success and usefulness as a viable form of governance. Even the Kenyan republic, albeit within the presidential context has in the recent past considered it as an alternative to its administrative woes. And although I am aware and others too: have noted it– the difference between a liberal civic state and an illiberal ethnic state (Pfaff 1993: 162; Ignatieff 1993; and Kymlicka 2002:345). No doubts such contrasts exist between south Sudan and the United Kingdom, with the former being purely ethnical, and if we add illiteracy into the comparison equation, not only would we contrast between one with aims for its citizens with one without aims, but contrasting between one with similar nature of political settings and has devised a solution for it, and one without such a solution. (South Sudan). The point that I am trying to make here is that: as an applicable policy, just like the UK’S devolution, where: Scotland, Wales, and Northern Ireland have their own elected governments’ representatives, responsible and answerable to their people, is worthy replication in South Sudan. Furthermore, South Sudan, in order to expedite its transition to democracy, and urgent pursuit of legislative reforms, it should move away from the presidential system of a republic to a parliamentary one. To briefly elaborate, in a parliamentary (World Bank suspects it as the most credible version of democracy), unlike the presidential system, and while both may recognise the judicial independence, the linkages between the branches of continuity of government are obvious! [in a parliamentary] For example: the executive is dependent either direct or indirect on the legislative, since a first requirement of entering into an executive branch of government is first and foremost dependent on being an elected member of parliament. Therefore, “the executive, strictly and often formed by the majority party or coalition of parties already elected members in the legislature, with a majority of the votes, thus, enabling them to pass legislation of urgent importance” (Bates, J, 1986). As often with the parliamentary systems, the Prime Minister (also an elected MP) is the head of the government of the day. Not only would this system provide us a vibrant form of a democracy (through parliamentary debates) directly with the Prime Minister, but also would provide us with another vacancy of importance-the presidency. Ceremonial as always is the case of parliamentary republics, it should be the post worthy of rotation as suggested by others seeking a rotational position in South Sudan. And in a presidential system as is the case with South Sudan, the president is, through a universal suffrage elected differently from the legislature and would go on to form an executive (from even unelected members) of his choice (mostly his party’s cronies). At worse still, is when the legislature is composed of members of different party (ies), if US is of any guides, a stalemate or legislative gridlock occurs. This may explain why many African opposition parties do not in any case win presidential or parliamentary elections- the executive in one way or another would prevent that. Moreover, South Sudan should consider an endorsement of the shadow cabinet (in a sense of executive) as a legitimate alternative to government (s) of the day. The benefits will be immediate. It would deny legitimacy or bases to those groups, who by finding no means of entering into government posts, often choose to wage unnecessary wars against people and the state in the names of “liberation”. As ambassador page notes, in the leads up to the current political impasse in South Sudan, that: “ there was not as much support for Machar in an organised manner, but a general discontent over the economic and political spheres, tied to crackdown on personal freedoms that resulted in a national disunity of an identity only forged by war” McNeish (2013). This suggests that neither opposition to this government or the SPLM is just an opposition to itself: Machar is an insider to both SPLM or Goss; and has nothing new or alternative to offer to the south Sudanese people; and thus either SPLM, SPLM-in-opposition are not oppositions: share the same history (ies) and run on the same software. More so, “given the past and current horrific and often ethnically motivated human rights violations, South Sudan should implement national truth, justice and reconciliation processes” and “If South Sudan does not implement such measures, supported by international mechanisms, the country will not realise lasting peace”, Beny and Adam (2014). The role of an ethnic factor in South Sudan: Democracy or Dinkocracy? Prior to the ensuing conflict, of which according to Aid agencies has over a thousand people killed and further thousands displaced. The south Sudanese politics suffered from some form of severe derogatory criticisms, including characterising its polity as “Dinkocracy” in reference to a perceived dominance by the ethnics’ members from the Dinka tribe. Whether there’s any truth in such a characterisation of Dinkas in government or other sectors in the country is hard to tell-as “truth” in this part of the world, according to Ivan Simonovic, the United Nations Assistant Secretary-General for Human Rights, is “itself ethnicized”. Truth, he says: “depends on what ethnic background you have [he]. He adds: “when I talked to displaced people, victims and their families in camps in Juba, Bentiu and Bor, I found their perception of the conflict so influenced by their ethnic affiliation that it was as if they lived in different realities”. This’s how unclear uncovering the nature of the truth in this conflict could be. But, What’s clear however, whatever the dimension of the conflict is: ethnical or political, is that, they are primarily the results of self-seeking group leaders-‘ethnic entrepreneurs’, who encourage feelings of resentment and inequality amongst ethnic members in order to justify maintaining control over them, and to justify their intentions for seeking government positions or leaderships. In South Sudan, ethnicity induced politicians (always ethnic elites) have incentives to keep group members in a (real or perceived) position of disadvantage, since their ethic based clientele (through ethnicity) and salaries would be gone if ethnic members become individualistic, albeit in the larger society. These “junk” elites, which Karl Marx would call “ethnic bourgeoisies”, manipulate ethnic members by keeping them ill-informed about their true opportunities in a country they rightfully own. For them, politics and ethnicity have no clear distinction: where ethnicity stops, there’s no politics, and where politics stops, there’s no ethnicity. A belief well entrenched in them to an extent that their public utterances are more often than others laced with ethnic overtones, such as the derogatory Dinkocracy. The victim, clearly, is the state. And therefore opposing what does not exist; such as “Dinkocracy” is a meaningless agenda. Anyone doubting this situation in South Sudan today would doubt some truth in this story about the motivations of some ethnic leaders. “Minority as well majority” group leaders can be as cynical and self-serving as political elites in the mainstream society of any developed nation. The fact that all government employees are “nominated” from payam (district) level administrators to the Council of States (south Sudan’s equivalent of the senate) members to obtain loyalty is in itself making things worse. But as Will Kymlicka opines: “the fact that people are asked to reason in abstraction forms from their own social position, natural talents, and personal preferences when thinking about others does not mean that they must ignore the particular preferences, talents, and social position of others”(Kymlicka, 2002). In this sense, ethnic Dinkas may numerically be the majority in south Sudan and is possible that one Dinka may politically support another Dinka, but there aren’t such things as “Dinka mind” which might warrant an ideologically based derogatory as “Dinkocracy” in south Sudan. In this regard, south Sudan might neither have, nor isn’t one of the democracy or the Dinkocracy as alleged. In lieu, until functional modes of governance are devised, it’s a theatre for ethnicity induced politicians to continue what they do to ensure their political positions and material survival—essentially through blood(s) of the dis-informed citizenry; hence “capitalism” of blood. 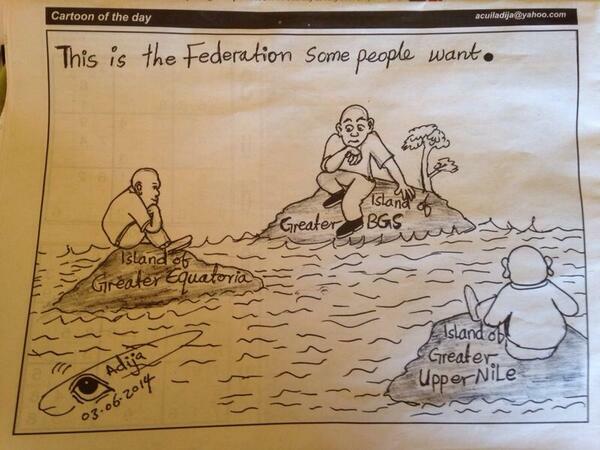 The Emergence of Perpetual realities and prejudices against itself: South Sudan, the struggle continues. One could say that, south Sudan is nation of refugees. And that’s vacuously true given the troubled history of the then unified Sudan, where throughout the 50 years of independence, the present south Sudan was a theatre for devastating civil wars. One of them, the second Sudanese civil war culminated into its independence from the rest of the Sudan. Throughout those periods, its inhabitants spread throughout the region and the world (mostly Australia and New Zealand, Europe and North America) in search for refuge and better livings. Those who remained, either as: active rebels with their hosts being remote villages in the south or lived in those outposts. Together I will, for the purposes of this discussion, and according to their sense of feelings, refer to them as “liberators”. Yet a few of them looked east of the region and briefly settled as refugees before being resettled into countries willing to receive them as permanent refugees by the United Nations High Commission, or the UNHCR as the war persisted. This’s the beginning of a factional group known as the “Diasporians” in Juba today. Others took Khartoum, the then nation’s capital as their home, with majority settling skimpily as internally displaced persons, or, the IDPS, a few of them based on political status and significance could settle as “Sudanese”. And are mostly designated the “khartoumers” including those, who before the autonomy, lived in then Sudanese government -controlled areas in major urban centres such as Juba, Malakal and Wau. This group, by the earlier 2000’s began through Egypt, a migratory process of abandoning Khartoum in search of bettering their opportunities similar to the ones who at first looked east of the region(Uganda and Kenya), then resettled into western-oriented economies: North America, Europe(western& northern), Australia and New Zealand. This’s the second diaspora community of Sudanese or south Sudanese descent presently colliding together over the opportunities of their indigenous nation. The result is what karl Marx called class antagonism. By the times of autonomous southern Sudan, through into current days of an independent south Sudan, both groups, while hopeful of having played crucial roles have met and meeting each other for the first time in South Sudan. Despite the ruling party, the SPLM promises of the “first class” citizenship in the new country, a call often accompanied by the over-used, emotionally- charged phrase, “our people”(often so misused that it has lost its lustre). The relationships aren’t easy, and the “classes” multiply even further. Often characterised by the labelling or designate ‘belittle and cowardice’, first: to the Khartoumer and the diaspora groups by the liberators. (Daily Monitor, 3 February, 2014) characterised this group, often: a highly militarised section of the society that is yet to embrace democratic institutions of governance; arms in the wrong hands and a tendency to resort to violence to achieve political ends; and the indiscipline of the Sudanese People’s Liberation Army (SPLA) a former guerrilla outfit that is yet to transform itself into a conventional army. This group claim itself “the liberators” of south Sudan: With majority of them forming the ruling class of South Sudan; and no body in south Sudan doubts. The doubts, however, is on mishandling of the society and the badly missed roles of government. They should expect no “peace” without justice. But one could say that south Sudan is effectively still at struggle—perpetual in nature and prejudice against itself. Unlike the “independence” struggle which united the society, this struggle divides it and continuous to do so. Thus, “a Post-independence South Sudan produced three types of people who are supposed to work together in the civil service but are competing with each other, owing to their backgrounds”: A perpetual situation that the Ugandan Daily Monitor called “the south Sudan’s unfinished business”. Besides their belligerent mentality, they do not believe in state entitlements, rather they think they “deserve” the government at all levels. “They have developed a military culture, with neither diplomacy nor skills in modern management styles. When given positions, they act with militancy and impunity, and often abuse their offices. Yet they feel that they deserve more because of the risks they took”. This has resulted from the days of autonomy to present into “a situation where people are appointed into positions even without [prior] experience and the educational capacity to handle the jobs”. This’s plausible a claim is, and perhaps a beacon of both corruption and nepotism, which despite government reshufflement after reshufflement the tendentious habit continue to persist at all levels of the government. Only the establishment of permanent impartial institutions, aided by yet impartial and active judiciary could fight such theft-laden vices in the society. Khartoumers and the Diasporians: the enemy of my enemy is my friend in a sense of entitlement battle of south Sudanese citizenship. The khartoumers: primarily those who previously remained in Khartoum-controlled areas in major urban centres such as Juba, Malakal and Wau and indeed Khartoum itself (Daily Monitor, 3, February, 2014). Even though they might be Christians, these people have internalised Arab culture in terms of their clothing, language, culinary habits and their worldview. They refer to both the Diasporians and the rebels as “pharats”: meaning “uncivilized”. Whether they’re right and how relevant it’s to government posts, is hard to tell. But they generally believe they deserve a bigger share in the government because they were the ones who were brave enough to remain while others ran away. Some of them studied in Arabic and cannot communicate in English, the official language. In their take on the diasporian group, they refer to them as “those [who] ran away from trouble and left them to endure the brunt of the war”. This view is echoed and believed by the liberators. A marriage seemly brought about, by the old adage that: “the enemy of my enemy is my friend” in a war of entitlement battle of South Sudanesecitizenship. Furthermore, though the diasporian group attained some good education, unparalleled by the south Sudan and even those in the region, during their time in exile, but also acquired different cultures, their attitudes and worldviews are in sharp contrasts with either the liberators or the khartoumers. They refer to them as merely backward mentally and indeed uncivilised humanly: reminiscent of “the third world mentality”. Something which, despite some of them occupying key government departments, “… their instructions are never followed because those responsible for implementation below them are either out of touch with what they are saying or are outright opposed”. Therefore, the liberators and khartoumers groups, who believe that those from the diaspora ran away from trouble and left them to endure the brunt of the war, with flimsy and out-dated education (though some of them were trained earlier, became soldiers and were rendered redundant after 21 years of war) they run south Sudan, not as an impartial country, but something, amounting to a property of their own. A situation if Professor Reeves is right in seeing both the SPLM and the government reformed can be avoided. The government of South Sudan right now reflects more than anything else [than] the structure of the guerrilla movement known as the Sudan People’s Liberation Army. But it’s not a guerrilla movement anymore; it’s a government of an independent country. And it needs to start acting like that. And it needs to reform governance in ways that make it much more democratic than it presently is (Gurtong, 28 January, 2014). This is the universality of the theory of democracy as I mentioned earlier in this piece; and in absence of such reforms, south Sudan, though as an independent country, the struggle to hold itself as a country continues. From constitutional failures, ethnic animosities, nation-building woes, and post-independent class struggles, the demands are great and dependent on the south Sudanese people, not outsiders to solve them; and no doubts that the subsequent life in south Sudan: would be determined by the issues that had their beginnings on the December 15th, 2013. But as a country, we’ve to forge ahead with or without that catastrophic event on our path: we should deserve better than this. Perhaps serving justice first to entail peace and continue our nation-building efforts; and perhaps entrusting ourselves to the rule of law and a new paradigm of government and governance to strengthen our unity, corporation and trust among ourselves. Mr Adut Naar is a final year student of Political Science degree, College of Arts: Victoria University, Melbourne Australia. With further interest in: Moral and political philosophy; International Law and the Global Justice. Disclaimer: The views expressed here are merely feelings of the author: has no an affiliation with, or influenced by, any political, Religious or Business entity. They’re neither a criticism to the government or meant in supports of anyone (group or individual) other than the South Sudanese people and those who sympathise with them. Alex De Waal and Abdul Mohammed (12 December 2013). “South Sudan must resolve ethnic conflicts to be a nation at peace”. Retrieved on 29 January 2014. Kymlicka, W (2002), “Contemporary Political Philosophy”, an introduction, (New York: Oxford University Press). T. St. John N. Bates (1986), “Parliament, Policy and Delegated Power”, Statute Law Review (Oxford: Oxford University Press). Hannah McNeish (17 December 2013). “South Sudan teeters on the brink” (Observers say ethnic tensions at the heart of ongoing fighting that may determine fate of the country). Retrieved and Viewed on 29 January2014.From:http://www.aljazeera.com/indepth/features/2013/12/south-sudan-teeters brink20131217131843385823.html. Posted: June 21, 2014 by PaanLuel Wël Media Ltd. in Poems. My husband why do you’ve to throw me in the garbage bin? But have you forgotten the time you used to run after me as if I was your air-conditioner in the scorching heat of kakuma? Was I of any embarrassment then? You named me Ghamar, the Moon. Do not tell me it is part of education to turn this way. Where did it go, my husband? Didn’t you have enough of my chest and thighs? Why do you want to see them outside? Or do you perhaps want to share them with the public? When was the last time you worn shorts in public? What happened to you, my husband? How many illiterates that could read and write, my husband? Remember when you dropped out of school to find a teaching job? When things got tougher, after I finished my ESL, I then went to work and encouraged you to continue your studies from certificate to degree. It’s me your Ghamar, the one you once loved!